Presenting the world's first video game written in Ant. 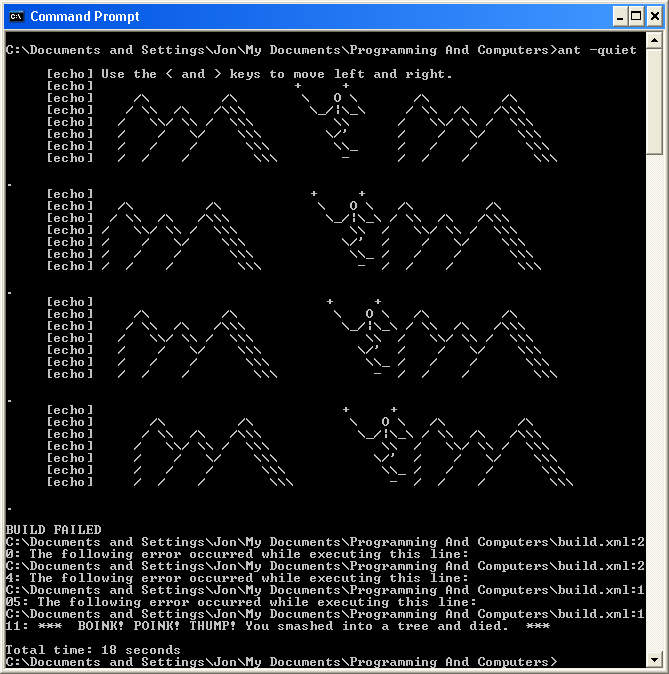 This is a cross-platform downhill skiing game in which you use the < and > keys to race down a dangerous ski slope. System requirements: Ant 1.6 and the Ant-Contrib library. And yes, it's written in Ant. How this came to be: Some co-workers and I were chatting today about some Ant features we learned about, in particular the very useful macrodef and import tags. Then it dawned on me that with the function-like behaviour that macrodef tags give us, we could do virtually anything. Heck, we could write a video game in Ant if we wanted to! My coworkers laughed at me. In the above screenshot, I have crashed into the trees on the right. As this is an Ant script, the bad news begins with "Build Failed". Note: If you succeed in skiing through the entire course and arriving at the bottom of the mountain, there is a pretty end-game screen as your reward! Simply copy the code below and fire up Ant using the command "ant -quiet". Note that you will need Ant 1.6 and the Ant-Contrib library. <!-- Generated using random numbers from http://www.random.org. posted by Jonathan at 2/25/2005 12:38:00 a.m.
Just when you thought you've seen everything. Can Quake for Ant be far behind ? By Anonymous, at 2/25/2005 9:58 a.m.
Hm ... AntQuake might be possible if we use the cls command to clear the screen. Even AntPinball would be kind of neat. By Jonathan, at 2/25/2005 10:00 a.m. The pinball mention is a tip of the hat to a past co-op boss, Bjorn Freeman-Benson, who tested new recruits by getting them to write a pinball game. By Jonathan, at 2/25/2005 10:04 a.m. Cool - one of my co-workers found that the game works in Eclipse 3.1. By Jonathan, at 2/25/2005 11:20 a.m.
By Matthew Inger, at 2/25/2005 1:03 p.m.
Fun stuff Jon...as the Eclipse Ant integration team lead, a protege of Bjorn's, and a past co-worker...too much fun for a Friday. By Darin Swanson, at 2/25/2005 1:18 p.m.
Hi Darin - Good to hear from you again. OTI - those were the days! I miss Smalltalk . . .
By Jonathan, at 2/25/2005 2:12 p.m.
By Vikram, at 2/25/2005 3:06 p.m. Thanks Vikram. Hope you got a chuckle out of it. By Jonathan, at 2/25/2005 3:08 p.m.
By Anonymous, at 2/27/2005 10:30 p.m.
Hi Jan. Ant download manager? Nice. Somebody write a Slashdot article on weird uses of Ant! By Jonathan, at 2/27/2005 11:37 p.m.
By Anonymous, at 3/24/2006 11:33 a.m.
You say that after you spent time reading the article and writing a comment?!?!?! By Anonymous, at 4/06/2006 2:11 a.m.
By panicave, at 7/23/2007 10:38 a.m.
By Jonathan, at 7/23/2007 11:29 p.m.
By juanluisbarquin@gmail.com, at 1/30/2008 6:31 a.m.
By free mmorpg, at 12/07/2008 6:22 p.m.
By Jonathan, at 12/07/2008 9:39 p.m.